In 1967, Lunar Orbiter Mission 4 sent back to Earth a superb series of photographs of the surface of the Moon, despite severe degradation caused by scanning artifacts and the reconstruction processes involved in transmission from lunar orbit. Using 21st century techniques, Charles Byrne, previously System Engineer of the Apollo Program for Lunar Orbiter Photography, has removed the artifacts and imperfections to produce the most comprehensive and beautifully detailed set of images of the lunar surface. The book has been organized to make it easy for astronomers to use, enabling ground-based images and views to be compared with the Orbiter photographs. The photographs are striking for their consistent Sun angles (for uniform appearance). All features have been identified with their current IAU-approved names, and each photograph has been located in terms of latitude and longitude. To help practical astronomers, all the photographs are systematically related to an Earth-based view. A CD is included with the book, providing the enhanced and cleaned photographs for screen viewing, lectures, etc. The far side of the Moon, also called the ‘dark side of the Moon’ was unknown to humanity until the Luna and Lunar Orbiter pictures were returned to Earth. Even since then, its nature has puzzled researchers. Now we know that a giant impact struck the near side with such force that it created the ‘near side megabasin’, opening the way for floods of mare and sending vast amounts of ejecta to the far side. “The Far Side of the Moon” explains this event and also documents the appearance of the features of the far side with beautiful pictures from Lunar Orbiter. As in the previous volume, “The Lunar Orbiter Photographic Atlas of the Near Side of the Moon”, the author has taken the original images and cleaned them of system artefacts using modern digital image processing. The best photographic coverage of the far side of the Moon has been the 150 photos taken by the Lunar Orbiter series. The other sources are pictures taken by the Apollo Command Module, which were limited to the equatorial regions, and the Clementine mission, which took pictures at a high sun angle that washed out the topography of the features. Until now, the far side Lunar Orbiter photos have only been available with strong reconstruction lines, but appear here for the first time as complete photographs, unmarred by imaging and processing artefacts. Also, this is the first book to explain in detail how the far side was deeply covered by ejecta from the Near Side Megabasin and modified by later impacts. A CD-R accompanies the book, and contains all the enhanced and cleaned photographs for use by the reader in screen viewing, lectures, etc. SpaceRef Review: As we descend upon the 40th anniversary of the first humans to stand on the moon, the books, and movies, and DVDs, and websites all seem hell bent on a collision – each one trying to best encapsulate the Apollo experience. While Apollo 11 was the first mission to put people on the moon – other missions followed. And while the experience of walking on the Moon was shared by a precious few, the opinions of the moonwalkers are remarkably diverse so as to allow everyone to identify with what it must have been like to be there. Once again, in his book “Voices From the Moon: Apollo Astronauts Describe Their Lunar Experiences”, author Andy Chaikin has managed to distill and then capture the essence of Apollo. Indeed, if there is anyone who has lived and breathed Apollo for the past 40 years, it has been Andy. He kept the flame alive when most of us looked at Apollo as old hat. Now, suddenly, it is new again. Andy did not write this book in the traditional sense. The words are virtually all from the Apollo crews. Nor did he take the pictures – they were also taken by others. Rather, Andy’s artistry is evidenced in how he sat and listened as the crew spoke – sometimes from the grave. He weaved their words and pictures into a narrative about what it was like to go, to live, and then to return from this amazing place. Many of the images are familiar but many more are not. Often, the images chosen for this book were not what people wanted to see in Life Magazine in 1969, so they were never seen by more than a small few. My favorite in this book is opposite Chapter 9 – “Apollo 13”. I am not certain if it was taken on approach or on return from the Moon. That said, it shows a small grey orb, partially lit in the distance – again it is either a destination or a memory. Across from the image is a quote from Apollo 13 astronaut Fred Haise which captures the moment when the crew simultaneously knew that their dreams were crushed – and their lives were very much at risk. Another favorite is a lunar panorama with a telephoto insert showing the Lunar Module “Falcon” utterly dwarfed as it is set against the vast expanse of the Moon. We seem to have forgotten just how awe-inspiring a place the Moon truly is. Maybe it is time to go back and get re-awed all over again. It is good that these voices were brought back together, perhaps one last time. As we celebrate the 40th anniversary of this grand human adventure, the eyewitnesses have already begun to dwindle in number. A decade hence, that number will be much smaller. Soon there will only be words and pictures. This book will be at the top of the pile. Bringing together a wealth of information from many sources, including some material never before published, this atlas is a comprehensive reference on lunar exploration. It tells the story of every spacecraft mission to the Moon since the dawn of the space age, illustrating each account with a unique combination of maps and annotated photographs. Many of the illustrations were created especially for this atlas, including panoramic photographs from every lunar mission. The missions are listed in chronological order, providing readers with an easy to follow history of lunar missions. Special attention has been given to describing the processes involved in choosing landing sites for Apollo and its precursors. The atlas also includes missions that were planned but never flown, before looking ahead to future missions as the world’s space agencies prepare for a new phase of lunar exploration. 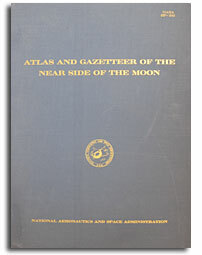 This atlas and gazetteer is a photographic and tabular compilation of named lunar features appearing on the near side side of the Moon. 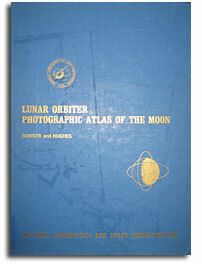 To provide an easy method of locating lunar features in the atlas, the names have been annotated on the photographs, which are accompanied by locational data regarding the named features. Five indices comprising he gazetteer are provided for appropriate cross-referencing of the high resolution rbiter IV photography and the mediaum-resolution photgraphy onbtained from the other orbiter missions. The Lunar Orbiter program was conceived, together with the Ranger and Surveyor programs, with the primary objective of providing information essential for a successful manned Apollo lunar landing. The Lunar Orbiter program comprised five missions, all of which were successful. As the primary objectives for the Apollo program were essentially accomplished on completion of the third mission, the fourth and fifth missions were devoted largely to broader, scientific objectivesphotography of the entire lunar nearside during Mission IV and photography of 36 areas of particular scientific interest on the nearside during Mission V. Photography of the farside during the five missions resulted in an accumulated coverage of more than 99 percent of that hemisphere. The detail visible in the farside coverage generally exceeds that previously attained by Earth-based photographs of the nearside; in some areas objects as small as 30 meters are detectable. Initiated in early 1964, the Lunar Orbiter program included the design, development, and utilization of a complex automated spacecraft technology to support the acquisition of detailed photographs of the lunar surface from circumlunar orbit. The five spacecraft were launched at 3-month intervals between August 10, 1966, and August 1, 1967. In addition to its photographic accomplishments, the program provided information on the size and shape of the Moon and the major irregularities of its gravitational field. This selenodetic information was derived from the tracking data. Micrometeoroid and radiation detectors, mounted on the spacecraft for operational purposes, monitored those aspects of the lunar environment. The Lunar Orbiter program initiated in early 1964 consisted of the investigation of the Moon by five identical unmanned spacecraft. Its primary objective was to obtain detailed photographs of the Moon. 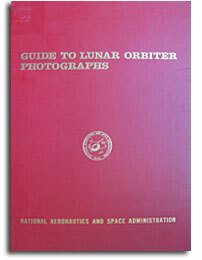 This document presents information on the location and coverage of all Lunar Orbiter photographs and is one in a series of four NASA Special Publications documenting Lunar Orbiter photography. The others are references 1 to 3. Reference 1 contains 675 photographic plates and provides coverage of the complete Moon with more detail than any other publication. Reference 2 is a collection of approximately 180 selected photographs and portions thereof at enlarged scale, and includes captions for each photograph. Reference 3 shows each named feature on the near side on annotated highresolution frames from mission IV. 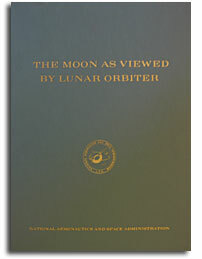 It also includes (1) an alphabetical index of features, (2) cross-indexes between listings in the catalog of the University of Arizona and the catalog of the International Astronomical Union which was published in 1935, and (3) listings of named lunar features on the near side covered during missions I, 11, 111, and V, and their photograph numbers. This document contains photographic supporting data for Lunar Orbiters 1 through 5. These data, which were compiled by the National Space Science Data Center (NSSDC), are necessary for the interpretation and analysis of high- and medium-resolution Lunar Qrbiter’photographs. 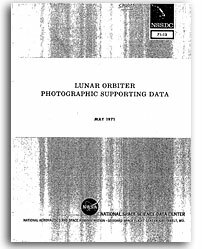 This document describes and presents the NSSDC Lunar Orbiter Photographic supporting Data printouts. Definitions of the elements of the data base, and the search capabilities of the NSSDC system used to produce these and other printouts are also included. Miles O’Brien and “This Week in Space” are back for their first show of 2010. In this episode: the space nation awaits direction from President Obama, Endeavour gets ready to deliver a room with a view, how an abandoned McDonald’s is being used to restore closeups of the Moon, a space telescope finds new planets, plus an interview with Hubble-Hugger-In-Chief John Grunsfeld. You also can subscribe for free to watch episodes from iTunes.